Chickpeas are a common staple across much of the Middle East and South Asia. 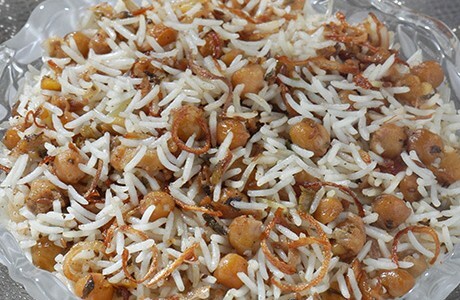 These delicious legumes are paired with light, fluffy basmati rice and a range of spices to create an aromatic dish that is suitable for vegetarians. Heat the oil in a pan; add the onions and sauté until brown. Reduce heat and add the yoghurt, ginger and garlic pastes, cumin and green cardamom seeds, green chillies, mint leaves, green coriander, garam masala, and salt. Mix well and continue to cook until the yoghurt is absorbed. Add the chickpeas to the spice mixture; mix well. Cook on simmer for 5-7 minutes. Bring 5 cups water to the boil in a deep pan. Add the rice and ½ tbsp salt; boil until the rice is more than half done. Remove from the heat and drain the excess water Transfer rice onto a tray to cool. In an ovenproof casserole spread ½ the rice. Cover with a layer of chickpeas. Sprinkle the milk over and then cover with the remaining rice, Sprinkle lemon juice and cover the casserole tightly first with an aluminium foil and then with a lid. Put the casserole in a preheated oven (I70°C / 325°F) for 30 minutes.